I’ve made it a lot over the last few weeks whilst trying to perfect the recipe. I haven’t got bored of it and would happily eat it 2 or 3 times a week if I could! The addition of fresh herbs in this recipe really makes it, so if you can possibly use fresh herbs, please do! You can always freeze any left over herbs for use another time. See this Martha Stewart video on Freezing Tarragon and this Kitchn article on Freezing Thyme! 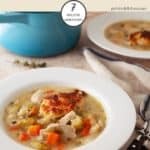 Other Weight Watchers Recipes with Chicken. If you are looking for other Weight Watchers friendly chicken recipes you may be interested in this Sweet and Sour Chicken with Zero Point Egg Fried Cauliflower Rice or perhaps these zero point Chicken Fajitas. This Creamy Chicken Casserole and this Chicken Leek & Mushroom Pie are also very popular. 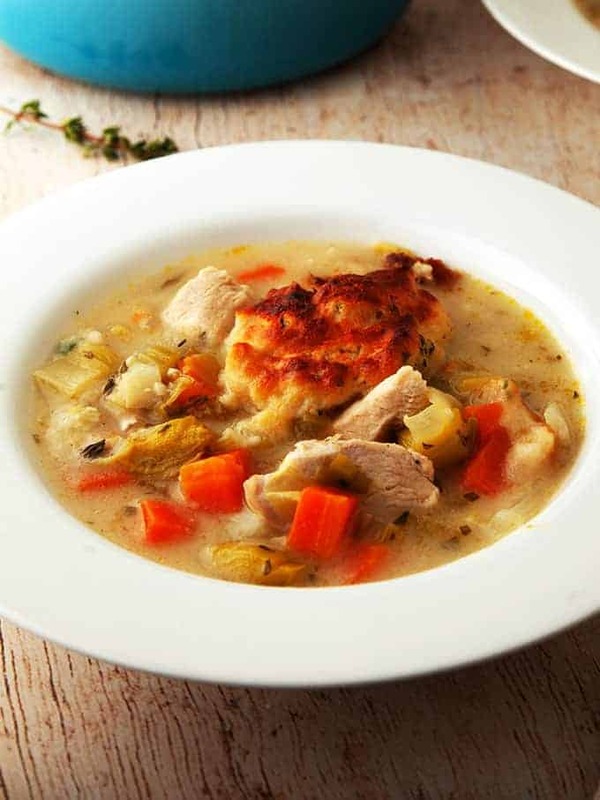 Tips for making Easy Chicken & Dumplings! Chop the celery, onion, leeks and carrots into roughly equal size pieces (approx 1cm cubes) so that they cook equally. Chop the chicken into chunks approximately 1 inch in size. This ensures that the chicken cooks through but will not overcook and become tough. How do I tell whether the dumplings are done? The dumplings will puff up nicely when they are added to the casserole dish / dutch oven. Cover with the casserole / dutch oven lid and simmer for 6 – 8 minutes. You then have a choice to either brown the dumplings or leave them unbrowned. I like my dumplings to be browned so I pop the casserole / dutch oven under the grill for 2 – 3 minutes until they start to brown. If you don’t care for browned dumplings then once the dumplings have puffed up they can be removed from the heat. Both ways the dumplings should be puffed up and firm. What Chicken Stock should I use? 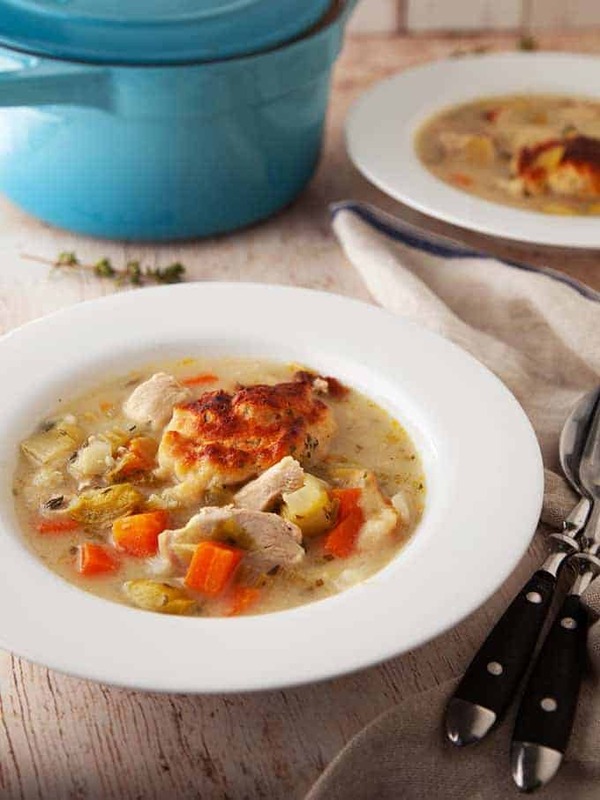 I used a Knorr Chicken Stock Gel Pot for this easy Chicken and Dumplings recipe. They are available to buy from Amazon and work out at 2 Smart Points per pot. Fresh chicken stock would also work out at 2 Smart Points for 800ml. If you use a stock cube / bouillon cube, such as Knorr Chicken Cube Bouillon you will need to use one and a half cubes. That works out at 1 Smart Points per 800ml of stock. Can I use shop brought dumpling mix? Yes you can use shop brought dumpling mix, just make sure that you half the amount of herbs that I have specified in the recipe as you won’t add them to the packet mix. Aunt Bessies Dumpling Mix, available from Amazon, works out as 5 Smart Points for 2 dumplings making no change to the overall point value of this recipe. Goldenfry Original Farmhouse Dumpling Mix, also available from Amazon, work out at 5 Smart Points for 2 dumplings making no change to the overall point value of this recipe. How to serve Easy Chicken and Dumplings. It is perfect on its own or could also be served with garden peas or other vegetables. 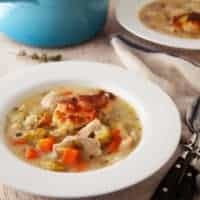 This easy Chicken and Dumplings is just 7 Smart Point per generous portion on Weight Watchers Freestyle plan. Heat the oil in a large casserole dish / dutch oven over a medium heat. Add the chopped leeks, celery, carrots, onions, and garlic and stir. Add 1 tbsp of the fresh chopped thyme and 1 tbsp of the fresh chopped tarragon. Saute for 5 minutes or so until the vegetables have started to soften slightly. Add the stock and bring to the boil. Once boiling add the cubed chicken, a pinch of salt and some grated black pepper. Lower the heat to a slow simmer and cover. Leave simmering for about 8 minutes until the chicken has just cooked through. Whilst the stew is simmering, combine the flour, baking powder, butter, pinch of salt and the remaining chopped herbs into a bowl. Cut the butter into the flour mixture until crumbly. Make a well in the middle to the mixture and pour in the milk. Combine till you get a wet dough. If you want your dumplings browned remove from the heat and place uncovered under a medium / hot grill for 2 - 3 minutes until they have turned golden brown.